When you visit the National have some fun in the new Scooters! exhibit. Look over the rare and interesting Salsbury, an innovative design from the late 1920’s, or study the tiny Doodlebug, made in Iowa. There is even a rare and stunning Rumi, an all polished aluminum two-stroke twin scooter made in Italy. The Salsbury Aero Model Motor Glide is one of the oldest scooters on display, originally designed and produced in 1938. Salsbury was an inventive person and applied his ideas and skills to the driveline. Instead of a multi-speed transmission you manually shift, the engine and final drive each have a pulley with moveable sheaves, moveable flanges. As engine and scooter speed increase, the flanges on the engine move closer together forcing the drive belt out creating a higher “gear ratio.” The scooter accelerates as engine speed stays constant. The styling of the Salsbury is almost as remarkable as the drive train. Today we know that Victory and Indian motorcycles are manufactured in Iowa, but even decades ago, Iowa had a motorcycle industry. 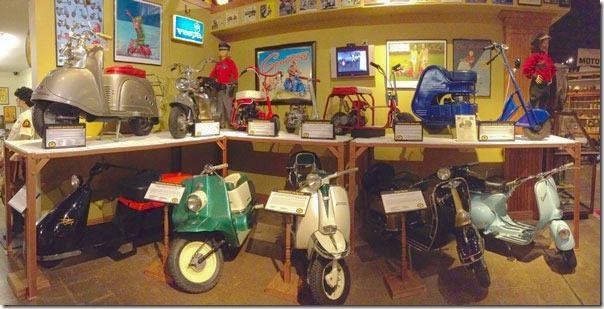 The Doodlebug, Argyle and Egley scooters were all manufactured in Iowa. The Doodlebug was probably meant for use around one’s property as it’s only about 2.5 horsepower. The Egley is a bit more powerful, has a longer wheelbase and could be used for several mile jaunts much as today’s scooters are employed. The Argyle could be taken along in the trunk of a car, even packed onto a small aircraft. The Italian firm, Rumi, perfected an interesting two-stroke air-cooled parallel twin of 125cc’s. While most know of that engine being using in touring and sport Rumis of the 1950’s, it also powered a very spectacular scooter. 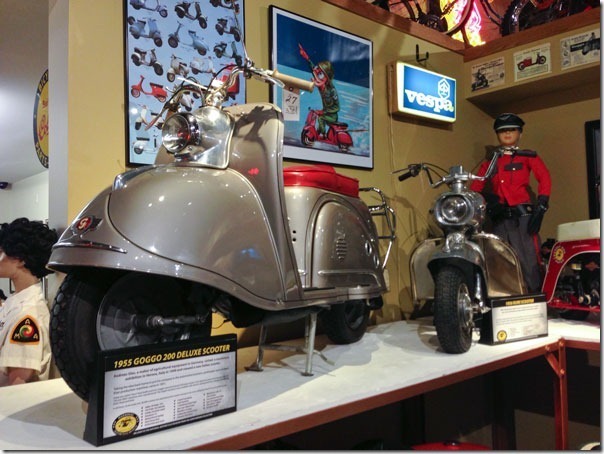 All body parts are polished aluminum which along with a hot 125cc twin engine makes for a dazzling scooter. When you think scooter, you think “compact.” Argyle scooters were unique for their all-aluminum construction, though some earlier versions used steel frames. Engines were two-stroke Power Products of 2.5 horsepower offering strong performance for such a small package. Drive is via belt and chain with a centrifugal clutch system. At 54 pounds, and foldable to a small package they were convenient to private pilots or car drivers who needed a runabout in a local area. Harley-Davidson saw the potential in scooters as well. In response to the post-World War II scooter craze, Harley-Davidson developed the Topper and released it for sale in 1961. Its CVT, continuously variable transmission, light weight and maneuverability made it easy to ride. The Topper’s flashy paint schemes were attractive to a group not currently Harley customers. 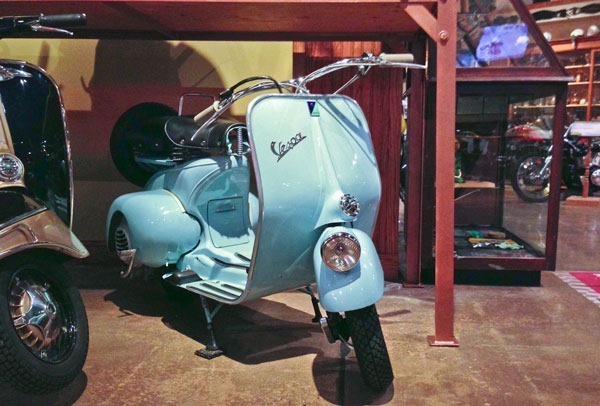 It offered step through mounting which was favorable to older riders and women in skirts and a rear brake pedal familiar to those driving automobiles. The sophisticated and lasting designs from the Italian firms Lambretta and Vespa, plus the striking GOGO round out the traditional offerings from Europe, but when you visit you’ll find out what other scooters are on view. But only through April, 2014 when this temporary exhibit will be replaced by another.